Cavod Academy / Blog / Lancaster County’s Only Certified Acrobatics Instructor! Cavod is proud to have as part of our team, Derek Martin, Lancaster County’s only certified acrobatics instructor! Derek has been a part of the Cavod family since 2008 and has had over 25 years of experience in gymnastics, including training under Olympic gymnasts. 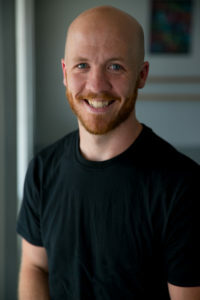 He also has many years experience in Hip Hop and ballet, and is a certified Cecchetti instructor. Derek’s time performing as a tumbler at the Fulton Theatre lead him to discover the acrobatic arts, which focuses on more than just tumbling in the midst of a performance, but rather fusing the athletics of tumbling with the artistry of dance. In addition to tumbling, acrobatics teaches skills in flexibility, strength, balance, and limbering that will enhance a dancer’s all around ability and performance. This new appreciation of the acrobatic arts lead Derek to attend a certification in Module 1 & 2 of the internationally recognized Acrobatic Arts Syllabus, making him a certified instructor, the only one in Lancaster County!